A SERIES OF demonstrations against the presumptive US Republican presidential candidate Donald Trump will be held when the controversial billionaire arrives in Ireland later this month. A “Trump Not Welcome” umbrella protest group has been set up to protest against the businessman when he lands here later in June to visit his golf resort at Doonbeg, Co Clare. The group – comprised of AAA-PBP and the Green Party as well as activists in women’s, anti-war and anti-racist organisations – had a meeting last night in which it organised a demonstration for Dublin on 23 June. It will be held at 6pm on O’Connell Street, depending on a final confirmation of Trump’s itinerary when he arrives. As well as the event in Dublin, the group says further demonstrations are planned for Clare – where Trump will be spending his time. Details of these protests have yet to be confirmed. Speaking on RTÉ’s Morning Ireland this morning, Green Party leader Eamon Ryan said that the demonstrations were being held to “make it clear that Irish people… don’t agree with Donald Trump”. “He’s not just here to look at his golf course, he’s here to drum up votes in his election and we think rather than just sitting back and saying nothing we think that it’s right for us to protest,” said Ryan. We don’t agree with the way he treats people from the Muslim community, we don’t agree with the way he treats people from the Hispanic community, we don’t agree with the way he treats women. Ryan said that the protests would need to be “dignified” and “peaceful” in order to show the world the billionaire’s politics were not welcomed by groups here. Trump has caused huge controversy in the United States over the past year – suggesting a ban on Muslims entering country and proposing to build a wall between the US and Mexico. 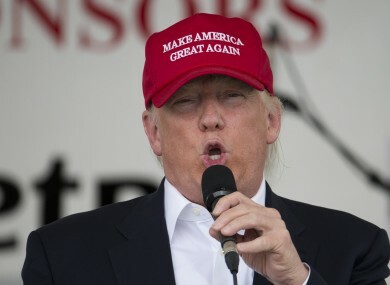 This hasn’t stopped him wiping out the the competition in the race for the Republican nomination for the White House, however, with his promises to restore jobs to the US and to “make America great again” striking a chord with disenfranchised voters. Finance Minister Michael Noonan met Trump when he visited Ireland in 2014. The government said today that it had not received any contact from a representative of Trump requesting to meet when he arrives in Ireland this time. Email “Newly formed anti-Trump umbrella group confirms protests in Dublin and Clare”. Feedback on “Newly formed anti-Trump umbrella group confirms protests in Dublin and Clare”.